Lipomas are fatty tumors found commonly in dogs. They appear in middle-aged and senior dogs, usually on the belly or upper legs, but can appear anywhere. Most lipomas are watched and not surgically removed, but if they are large, impede movement or function, or suspected of being malignant, they are removed surgically. Please note: The photos in this gallery are graphic and not for those who are squeamish at the sight of blood or surgery. In this case, the lipoma is a large baseball-sized mass on the underside (ventral) of the neck, potentially being a problem for breathing, proper collar fit and close proximity to the vessels, nerves, and muscles in this area. 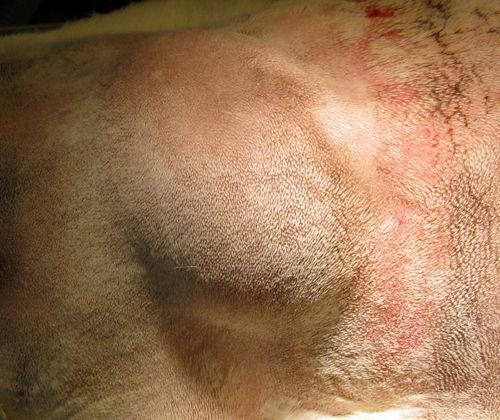 The skin is incised over the lipoma, taking care to stay superficial and not cut into the fatty tissue of the lipoma. Lipomas are usually fairly well encapsulated, with small vessels, making them easy to remove. The surgeon's sterile gloved fingers probe and gently dissect the connective tissue surrounding the lipoma. This helps define the mass and reduce small vessel bleeding in preparation for lipoma removal. To help define and prepare the lipoma for removal, blunt surgical scissors such as Mayo scissors are used to dissect the connective tissue. In this case, the scissors are not used to cut tissue; instead, they are inserted closed and then opened to gently separate the lipoma from the subcutaneous tissue. Once the lipoma has been bluntly dissected under and around the mass, it is freed from the base connection. Lipomas do not usually bleed very much. The blood in this photo is mainly seepage from the surrounding tissues. Once the lipoma has been localized and dissected away from the connective tissue, it is externalized and removed. The majority of lipomas slip right out without the need for vessel ligation, as in this case. Sometimes, though, the lipoma infiltrates muscle or other tissues and additional careful dissection is needed. Connected blood vessels are ligated if necessary. Whenever a large lipoma or any large mass is removed, the closure must be done in several layers to reduce the remaining cavity. This "dead space" area can be a place that seromas can form, especially if it is an area of movement, such as a leg (or a neck). Dissolvable suture material is used to close this space and the subcutaneous (below the skin) layers. The lipoma after surgical removal. Notice the lobulated areas and how well it is encapsulated by membranous tissue. This lipoma released nicely and came out in all one piece with minimal bleeding. The underlying tissue and subcutaneous layers were closed with a dissolvable suture material. The skin was closed with stainless steel surgical staples, which were removed 10 days later. Throughout the procedure, the patient's vital signs were monitored: heart rate, respiratory rate, blood pressure, and blood oxygen saturation. The patient received IV fluids, gas anesthesia, and post-operative pain medications. The dog recovered quickly and uneventfully.